Playa del Rey (Spanish for "Beach of the King" or "King's beach") is an affluent beachside community in the Westside of the city of Los Angeles, California. It has a ZIP code of 90293 and area codes of 310 and 424. As of 2014, the Playa del Rey (zip 90293) population was 12,129 people. Since 2000, it has had a population growth of 14.61 percent. Playa del Rey is a coastal neighborhood and a district of City of Los Angeles. The rolling hills are the result of ancient, wind-blown, compacted sand dunes which rise up to 125 feet (38 m) above sea level, originally called and often referred to as The Del Rey Hills or "The Bluffs". These dunes run parallel to the coastline, from Playa del Rey, all the way south to Palos Verdes. The community is bordered by the Pacific Ocean to the west, Marina del Rey and Ballona Creek to the north, Ballona Wetlands and Playa Vista to the northeast, Westchester to the east, and Los Angeles International Airport and El Segundo to the south. The northern part was originally wetlands, but the natural flooding was halted by the concrete channel which contains Ballona Creek. In the 1870s, Playa Del Rey was the location of the first attempt at a dredged harbor in Santa Monica Bay. Under contract with the Atchison, Topeka & Santa Fe Railroad, Moye Wicks' syndicate spent $300,000 to dredge "Port Ballona Harbor", for shipping to the Orient. Within three years, winter waves brought flooding, but what remained of man's early efforts became the Playa Del Rey Lagoon, now a regional public park. Palisades del Rey (also, Palisades Del Rey) was the name of the original 1921 neighborhood land development by Dickinson & Gillespie Co. that later came to be called Playa del Rey. The company advertised this area of sand dunes as the last stretch of coastal land in the city of Los Angeles to be developed. All of the houses in this area were custom built, many as beach homes owned by Hollywood actors and producers, including Cecil B. Demille, Charles Bickford, and others. Construction in Playa del Rey surged in 1928 with the development of the Del Rey Hills neighborhood in the Eastern part of the community (to the East of Pershing Drive), and the move of Loyola University (now Loyola Marymount University) to the adjacent community of Westchester. The southern portion of the original Playa del Rey development, which came to be known as "Surfridge," is now vacant. Between 1966 and 1975 the houses that were once there were either moved or demolished to facilitate the expansion of Los Angeles International Airport (LAX) and to address concerns about the noise of increasing jet plane traffic. The noise from the flights made it less desirable to live on the dunes above the ocean under the LAX flight path. The City of Los Angeles condemned the southern section of Playa del Rey under the power of eminent domain, and purchased all of the homes. Today one can see only barbed-wire fences protecting vacant land and old streets where houses once sat. Recent LAX rejuvenation plans call for the city to finally remove the old streets that still line the empty neighborhood. The condemned areas of the community are now a protected habitat of the endangered El Segundo blue butterfly. Playa del Rey in the 1950s and early 1960s was known as a great Los Angeles area "surfing spot", but due to the many rock jetties that were built to prevent beach erosion, the good surf is mostly gone. The beach at the northernmost end of Playa del Rey is still known as "Toes Over Beach", "Toes Beach" or just "Toes" by the local surfing community, a name derived from the toes over or Hang Ten surfing maneuver. Most surfers now flock south of Dockweiler Beach, to "El Porto", the northernmost part of beach in the city of Manhattan Beach. The lifeguard and park services are uniform across the entire twenty-mile stretch of beach. One danger for beachgoers is the uncontrolled water runoff from the creek, and the occasional overflow from the giant Hyperion treatment plant to the south. Locals refer to the small area of housing closest to the beach, where Culver Boulevard joins Vista del Mar, as The Jungle, a nickname given to a group of closely built apartments built in 1956, bounded by Trolley Place and Trolleyway Street on its east and west respectively, and including the streets Fowling, Rees, Sunridge and Surf. The small sidewalks between homes had/have deep green overgrowth, which added to the name. Today a bridge between Playa Del Rey and the jetty between Ballona Creek and the Marina is accessible to foot traffic and bicycle traffic, but not to automobiles. Bikers, skaters and joggers probably have the best chance of traversing the sidewalks of the beaches north to Santa Monica, and to the South Bay, here at this bridge. Both UCLA and LMU have crew teams that practice on the Ballona Creek channel and Marina del Rey. Overlooking the entrance to the marina and Ballona Creek, with the tightly packed area known as The Jungle in the foreground. The community's proximity to LAX has made airport expansion a controversial issue to residents. 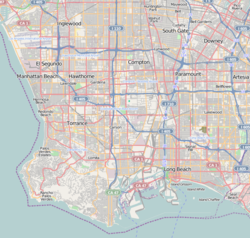 In 2009, the Los Angeles Times's "Mapping L.A." project supplied these Playa del Rey statistics: population: 9,755; median household income: $91,339. According to data from the Los Angeles Times's "Mapping L.A." project, the area's demography was 72.6% White, 7.7% Asian, 3.9% Black, 10.0% Latino (10.0%) and 5.8% of other backgrounds. The vast majority of land in Playa del Rey is zoned for residential purposes only. It is known for its large beachside estates. Only portions of Manchester Blvd, Pershing Drive and Culver Blvd have businesses—mainly restaurants and a pharmacy—and offices mixed in with residential buildings. The average household income is 126,005, which is a high figure for the state. Los Angeles Fire Department Station 5 (Westchester/LAX Area) is in the area. The Los Angeles County Department of Health Services SPA 5 West Area Health Office serves Playa del Rey. Playa del Rey lies entirely within the 11th council district of Los Angeles, and is represented on the city council by Mike Bonin. Playa del Rey is within the Los Angeles Unified School District. The area is within Board District 4. As of 2009 Steve Zimmer represents the district. St. Bernard High School is a private Roman Catholic school in the area. Del Rey Christian Children's Center is a private Christian preschool. As of 2014, the Wiseburn School District allows parents in Playa del Rey to send their children to Wiseburn schools on inter-district transfers. Dave Draper. bodybuilder, television host. Phil Jackson, former coach of the Los Angeles Lakers. William C. deMille, film director. Sugar Shane Mosley, former World Champion boxer, recently purchased two homes overlooking the beach. Tara Reid, actress and pop culture figure. Dawn Robinson, original member of the group En Vogue. Donda West, late mother of hip-hop artist Kanye West. ^ Groves, Martha (2005-01-20). "Line drawn in sand over Dunes project". CalCoast News. Archived from the original on September 24, 2005. Retrieved 2008-06-17. ^ Film Stars of Playa Del Rey; Charles Bickford, by Duke Dukesherer, Examiner.com. ^ Ding, Kevin. "News: Jackson accepts Lakers extension." The Orange County Register. Friday November 30, 2007. Retrieved on June 13, 2009. ^ "Donda West dies at 58; local resident and mother of hip-hop artist Kanye West." The Argonaut. November 15, 2007. Retrieved on June 13, 2009. Beach Of The King: The Early History of Playa Del Rey, Westchester, Playa Vista, California by D J Dukesherer. Playa Del Rey: California by D J Dukesherer. Wikivoyage has a travel guide for Playa del Rey. Surfridge: A Los Angeles' Ghost Town. Photos of the condemned area of Playa del Rey. This page was last edited on 19 October 2018, at 18:48 (UTC).